Johne's disease (JD), also called paratuberculosis, is caused by infection with the organism Mycobacterium avium spp. paratuberculosis (MAP), leading to chronic diarrhoea and ill thrift in adult cattle . Typically, animals are infected as calves, but do not present with clinical signs until much later in life. Studies on JD are difficult due to long incubation period, complex exposure factors and poor test sensitivity associated with this disease [7, 15, 10]. Johne's disease is considered to adversely affect farm performance and as a result, economic profit. Currently, little data are available about the impact of JD on farm production in Ireland. Based on international studies, JD infection is associated with reduced milk production , increased involuntary culling rates  and increased calving interval and infertility [14, 20]. Concern has been raised over potential links between Johne's disease in cattle and Crohn's disease in humans, which may lead to international barriers to trade in milk and milk products, including infant formula. This is of particular relevance to Ireland, noting concerns about MAP in raw milk , and the significant share (15%) Ireland has in the world powdered infant formula market . This paper aims to describe the impact of JD on an Irish commercial dairy herd, and the effect of animal JD status on several measures of production. The history of the JD outbreak on this farm, including its impact on farm income, has been documented previously . Farm performance prior to the disease outbreak was in the upper quartile of its peer group of milk monitored herds. This retrospective case study was undertaken on a single commercial dairy herd (the 'case herd') located in the province of Munster in Ireland. The case study is an investigation of the effect of Johne's disease on production in the herd confirmed. The Munster region in the south west of Ireland is the country's premier dairy area: in 2006, 61% of dairy calves in Ireland were born in this province . The study was conducted over 11 years (the 'study period') from 1994 (the year prior to the first JD clinical case on the farm) to 2004. Health and production data from all cows in milk during this period (the 'study animals') were considered. Animal and lactation were each units of interest. On the study farm, there were an average of 71 cows in milk during the study period, with an annual average milk production of 5550.3 kg/year (SD = 431.2). Over 64% of the herd had Holstein or Friesian genetics, with the balance being a mix of other dairy and beef bloodlines. JD infection was first confirmed in the herd through laboratory diagnosis in April 2000. Between 1995 and 2002, the disease was untreated and herd production decreased . Several reasons (e.g. liver fluke) for the poor herd production were suggested by the veterinarian to the farmer, but none proved correct. Eventually, the farmer requested that the three animals that were currently very 'poorly' in the herd be tested for Johne's disease in 2000. Following this, a detailed JD herd investigation and testing management commenced in early 2002 to create a suitable JD control programme for the herd. This included the documentation of clinical signs and widespread use of faecal culture and ELISA testing on individual animals in the case herd. Faecal samples for culture were forwarded to the Central Veterinary Research Laboratory (CVRL) of the Department of Agriculture, Fisheries and Food (DAFF) where they were cultured on Herrold's egg yolk agar as described previously . ELISA analysis was also conducted at the CVRL using the ELISA Bovine Paratuberculosis Serum Verification kit (Institut Pourquier, France). Animals were considered ELISA positive if the sample (S/P) ratio was ≥ 70, and negative otherwise for the purposes of classification in this study. The JD control programme, described previously by  focused on the identification of positive animals though a series of ELISA and faecal tests followed by the strategic removal of positive animals. The overall strategy of the control programme focused on maintaining a viable milking enterprise. Removal occurred at the end of the cow's current lactation to reduce economic impacts and avoid over-wintering infectious cattle that are likely to go clinical the following spring. An exception to this was when the animal showed severe clinical signs, in which case it was removed immediately. Removal was combined with management changes (for example, maintaining high bio-security for heifer calves including prompt separation from the dam and the use of colostrum from healthy cows to individually feed calves) to reduce within-herd transmission. For each study animal, we collected both general data (animal identification number, dates of entry to and exit from the herd, reason for culling and culling price [the monetary value received by the farmer]) and data about each lactation (parity number, calving date, year of lactation, days in milk, milk yield [total kg per lactation] and average [geometric mean over the lactation] somatic cell count [SCC]). These data were obtained from the Irish Cattle Breeders Federation (ICBF), from the DairyMIS system (Moorepark Dairy Production Research Centre, Teagasc, Fermoy, Co. Cork, Ireland) and from the farm register. Data were also collected about JD-related events, including clinical observations and test results (ELISA and faecal testing dates, test type and test result). These were obtained from farmer, DAFF and CVRL records. Data were assembled from relevant databases using Microsoft Excel 2003 and Access 2003 (Microsoft Corporation, Redmond, WA, USA). a Included 56 cows culled for JD from 2002 to 2004. Clinical cases: all animals that presented with clinical signs consistent with JD, including scouring, bottle-jaw development and/or significant body weight loss. Test-positive cases: all animals that were test positive (faecal culture and/or ELISA), but without clinical signs consistent with JD. Testing did not commence until the latter part of the study period (from 2002 onwards). Given the very high herd prevalence of JD in 2002 and high between animal transmission rate in a highly-infected herd combined with the long incubation period of the disease, the authors were confident that animals with clinical signs prior to 2002 were JD cases. Secondly, as the aim of the control programme was to be economically viable, it was not considered necessary to confirm each JD case. Cases that were confirmed by faecal culture may have been confirmed either pre-culling or post slaughter, depending on the stage of the control programme and how severe clinical signs were in the animal. These two groups of case animals were mutually-exclusive as only non-clinical test positive cases were included in the second group. The effect of JD status on cull price was examined prior to the start of the herd investigation and subsequent control programmeme, between 1994 and 2002. Cull price of clinical cases was compared to that of all other animals, using an independent t-test. Where applicable, the cull price in punts was converted to euro at the rate of 1 punt1 = 1.27 euro. Clinical lactation, being a single lactation from each clinical case, either the lactation in which clinical signs were first detected, or the prior lactation if the former had not been completed2. Pre-clinical lactation: for each clinical case, the lactation immediately preceding the above-mentioned clinical lactation. Test-positive lactation, being a single lactation from each test-positive case, either the lactation during which the animal first tested JD positive, or the prior lactation if the former had not been completed. Control 1 (for comparison with clinical lactations) containing cows with a matched lactation selected from all study animals except clinical cases. Control 2 (for comparison with pre-clinical lactations) containing cows with a matched lactation selected from all study animals except clinical cases. Control 3 (for comparison with test-positive lactations) containing cows with a matched lactation selected from all study animals except clinical and test-positive cases. Therefore, three case-control comparisons were used: clinical comparison (clinical lactation, control 1 lactation); pre-clinical comparison (pre-clinical lactation, control 2 lactation); and, test-positive comparison (test-positive lactation, control 3 lactation). Three separate general linear regression models (one for each case-control comparison) were conducted in SPSS to determine the effect of JD on milk yield (total kg per lactation). DIM was included in the model as a covariate. Model fit was assessed using the R2 value. SCC was assessed by re-coding case and control animals into high SCC and low SCC using a cut-off cell count of 250,000. All values below the cut-off were labelled as low (acceptable cell counts) and values above the cut-off value were labelled as high. The approach of categorising SCC was used by , who similary used a cutoff point of 250,000, that was originally determined by . The frequency of high and low SCC values were compared between case and control groups for each JD status using a Chi2 test. During the study period, production data were available for 283 animals and 717 lactations. On-farm JD investigations commenced in 2002. Initial herd test results from March of 2002 resulted in 80% of ELISA (n = 91) and 100% of faecal culture tests (n = 18) reading positive which confirmed the presence of Johne's disease at a very high prevalence in the herd. 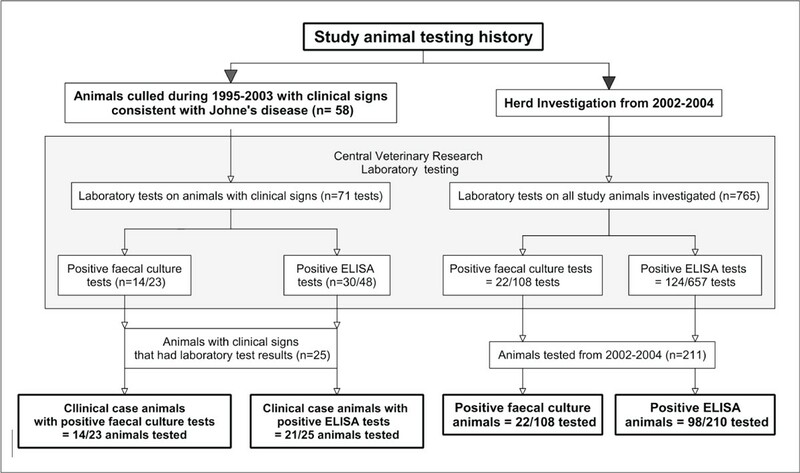 During 2002 to 2004, 765 JD tests (faecal culture (n = 108) and ELISA (n = 657)) were conducted on 211 animals, leading to the identification between 2002 and 2004 of 22 and 98 animals positive on faecal culture and ELISA, respectively (Figure 1). Testing history summarising the number of animals on the study farm that tested positive for Johne's disease during 2002 to 2004, and were culled with clinical signs consistent with Johne's disease (including scouring, bottle-jaw development and/or significant body weight loss) during 1995 to 2003. In total, 58 clinical cases were identified in the study herd, the first in 1995. Testing was conducted on 25 of these animals (Figure 1). Not all clinical cases were tested for two reasons: No test results were available on clinical cases occurring prior to 2002 as systematic animal testing only commenced in 2002. From 1995 to 2002, clinical cases were those that had presented with clinical signs consistent with JD. Once the herd was declared positive and widespread culling commenced in 2002 as part of the JD control programme, it was not considered necessary to test each clinical case. Clinical signs consistent with JD were not observed after 2003. During the study period, infertility and JD culls (which only included animals culled due to the JD control programme from 2002-2004) were the main reasons for culling (Table 1), accounting for 31.3% and 28.3% of culls, respectively. Table 1 displays the influence of all other culling reasons: abortion, accident, bad legs, damaged udder, late calving, low production, mastitis, old age, other reasons, pining, slow milker, surplus and TB. 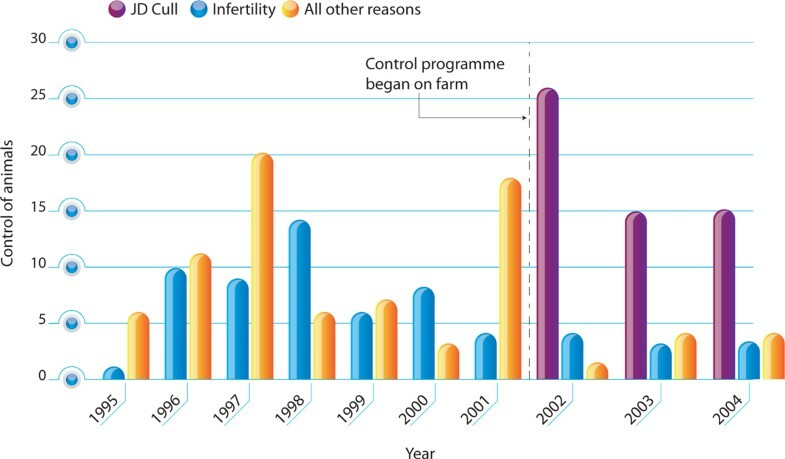 Infertility had a steady influence on culling decisions throughout the study period (Figure 2). However, infertility was a more frequent reason for culling at the start, compared to the end, of the study period (Figure 2). High counts of 'other reasons' seen in 1996, 1997 and 2001 were all due to a high number of animals culled as 'surplus' in these years. The temporal trend in the number of cows by parity (1, 2, 3, 4+) is presented in Figure 3. 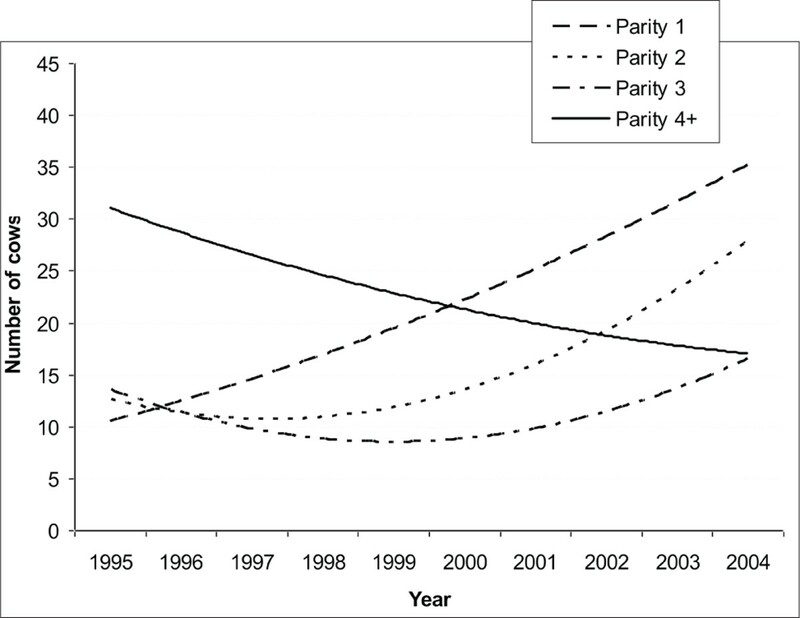 There is evidence of a steadily increasing replacement rate over the study period, particularly post 1999, when parity one animals make up the largest parity group on the farm. Figure 3 highlights the dramatic switch in parity structure in the herd over the study period. Count of culls on the study farm. During 2002-2004, 'JD cull' cows were culled as part of the JD control programme. The temporal trend in the number of cows in the study herd, by parity. The average milk yield and number of clinical and testpositive cases in the study herd during 1995 to 2004 is presented in Figure 4. The average milk yield, and number of clinical and test-positive cases, during the study period during 1995 to 2004, testing for JD started in 2002. There was a significant difference in cull price for 18 clinical cases compared to 59 non-JD culls (mean difference of €516, P < 0.001). The number of lactations in each case-control comparison is presented in Table 2. The adjusted effect of JD status on milk yield for each case-control comparison is presented in Table 3. JD status was associated with a significant difference in milk yield in the clinical lactation, with an annual reduction of 1259.3 kg of milk compared to the matched control group. Negative value indicates that average yield was lower in case compared to control lactations. No significant effect of JD status on SCC was noted for any of the three match case control groups. No case or control group had an average cell count of greater than 140,000. The highest noted cell count amongst the six groups was 1,240,000 (recorded from a control animal), which was 400,000 higher than the next highest count. Only 10/254 (4%) animals had cell counts over 400,000, and 19/254 (7%) animals had counts higher than 250,000. This study highlights the adverse impact of JD on herd fertility, parity structure and milk production in a single Irish dairy herd. The adverse effects of the JD had both direct and indirect effects on farm performance. Direct impacts of JD on production included a decrease in milk yield and cull price in animals with clinical signs. Indirect impacts of JD noted in the herd were high levels of culling for infertility and changes to parity structure. This change in parity structure during the study period was a consequence of increasing replacement rates. These impacts combined to have negative economic consequences for the herd, as noted by Barrett et al. . Significant losses in milk production in the last full lactation (-1259.3 kg/lactation) by clinical animals compared to non-clinical cows support concerns that JD is associated with reduced milk production in the herd. Similar results have been noted elsewhere [15, 20]. Bulk milk tank SCC is considered a measure of milk quality, and counts greater than 200,000 cells/mL have been found to constitute economic loss [19, 16]. No difference in SCC between case and control animals was noted in this study, and although higher counts in individual animals may affect bulk tank readings, it would appear that SCC did not respond to high levels of JD infection in the herd. Culling price was significantly lower (516 on average) for clinical animals compared to animals culled without clinical signs. High rates of culling due to infertility and increasing replacement rates result in indirect (long term) costs to production. High replacement rates are inefficient, noting that a parity one cow milks at approximately 75% of her mature equivalent . At the beginning of the study period, the milking herd was predominantly mature milking cows. However, this changed during the study period towards younger cows. Heifers may have reduced feed efficiency and possibly smaller calves compared to mature cows . Furthermore, high culling rates may make it hard to retain high genetic merit animals in the herd . At the farm level, aggressive control programmes often include a culling strategy where a decision must be made when to cull the JD infected animal. This decision must balance the need to maintain farm profitability with reducing (or eliminating) disease transmission in the herd [7, 21]. A farmer (and possibly his/her assisting veterinarian) can only cull on the information available to them: the approach used here was aimed to help inform culling decisions. In the current study, definitions of JD status were intended to apply in a practical context. Once a herd has been identified as positive, clinical signs and ELISA tests are convenient ways to identify positive animals. The study investigated milk yield and SCC at three different stages of JD infection: the lactation where the animals showed clinical signs: the lactation prior to that; and, lactation of test positive animals not showing clinical signs. These definitions worked well, the main problem being that the lactation prior to clinical signs could only be determined for animals identified as clinical, which meant that this group was constrained to only include animals that had clinical signs. Animals that were culled on ELISA results prior to showing clinical signs or those that did not show any clinical signs at the time of the study (but later did), would not be included. As such, there may have been animals that belonged in this group but could not be correctly identified on the available data. Our results suggest that test positive and pre-clinical animals did not show any milk loss. This information, combined with knowledge that clinical animals often shed high bacterial counts, can aid optimal culling decisions. For example, from an economic perspective, where production loss was not noted in the absence of clinical signs, early culling would not improve herd milk production. No effect of JD on production was noted for animals positive by test only. This finding is consistent with results from three out of four herds investigated in a New Zealand study  which used repeated ELISA testing to identify JD in cattle. However, in the current study, all clinical positive animals were removed from the test positive group before the analysis which may have affected the results for the test positive group. This study would suggest there is little loss in milk yeild for animals not showing clinical signs, however the financial impact of the disease in the herd discussed by  clearly shows the large reduction in performance over the time period in comparison to other milk recorded herds. As controls were selected from within herd, the overall effect of the disease could not be assessed. A case-control study is not a comparison between diseased and 'healthy' animals; rather it is in investigation between cases and individuals that have had the same potential for exposure to infection . In this study, to some degree, all animals in the herd probably had exposure to MAP as it was well established in the herd. This study only considers within-herd effects, therefore possible herd-level suppression of milk due to JD is not considered. If this latter possibility were true, then differences between clinical/sub-clinical and healthy non-JD affected control animals could be much greater if herd-level infection were taken into account . The study farm offered a unique opportunity to examine the effect of JD on herd production in Ireland. This farm had excellent production records, including detailed milk recording data, over many years, thereby enabling quantitative analyses to be conducted. Because this study was conducted on a single herd, these findings are difficult to extrapolate. Nonetheless, the impacts of this disease are unlikely to be dissimilar in other Irish herds where JD has established, or is establishing. At the time of this study, further suitable herds (that is, those with both JD and extensive records over many years) were not available. It would be valuable to repeat this study using data (when available) from a range of infected and non-infected herds, to examine animal and herd-level factors. Comparisons of production between herds are complicated by having to account for all confounding variables between herds, and expensive as each herd would have to be completely tested, possibly on several occasions. The effect of JD on measures of fertility was not quantified in this study as tight culling practises on infertility were considered to have affected calving interval data for cows. Furthermore, no account was taken of other factors (e.g. herd management) that may have changed over the study period, although the farm was run by the same owner/operator over the entire period. Similarly, no 'time' effects, such as inflation were accounted for in the cull price analysis. As a result of broad concerns regarding both human and animal health, efforts to control JD are underway in leading dairy nations, such as the Netherlands, a number of US states (including New York, Pennsylvania and Wisconsin), France, Great Britain and Australia . These concerns are also relevant to the Irish dairy industry, which exports approximately 85% of annual production . To keep in line with other leading dairying countries, Ireland may need to look further into the practicalities of JD control both on-farm and nationally. Currently, Irish government and industry are working to set up a herd health initiative to better manage a range of animal health issues in cattle. The production impacts noted in this paper highlights some of the potential issues JD poses to farmers in Ireland. Clinical JD infection negatively impacted milk yield and culling price in the study herd. In contrast, little effect was noted for SCC or sub-clinical infections. These effects, in combination with infertility and high replacement rates, contributed to economic losses for the farm over this period . Comparable infections are likely to have similar economic implications for Irish farmers with clinical infections in the herd. This case study has provided preliminary information regarding the effects of JD status on both herd and animallevel performance in Ireland. 1 The 'Punt' is the term used for the Irish pound which was the currency used in Ireland before the country converted to using the Euro on January 1, 2002. 2 In this study, an 'incomplete lactation' was where the lactation persisted for less than 100 days. The authors wish to thank Margaret Good and Martin Hayes DAFF for their generous help in providing laboratory test data and on-farm JD control programme background information. Furthermore, the authors wish to thank the Irish Cattle Breeding Federation for providing milk recorded data (with farmer permission) from the case herd for the study. This study would not have been possible without the co-operation and assistance of the farmer involved, for which the authors are very grateful. The authors would like to acknowledge the financial support of CVERA in the writing of this paper.